We got a card reader over the weekend that allows me to transfer photos from my phone to my laptop. My phone's gallery was becoming unmanageably large. Interestingly, my 1,048 photos take up less than half of my itty-bitty memory card. My baseline expectations were set (as is so often the case) in childhood. 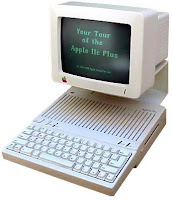 My folks bought an Apple IIc when I was around 5th grade. The thing didn't even have a hard drive. Both the programs and the work were saved and accessed on a "floppy" -- a flexible plastic disk just over 5" square. To compare the technology, it would take over two thousand of those disks to hold what is on my fingertip-sized phone card right now. I remember using that computer for the first time to write a spelling assignment. My brother started the machine for me, got the program running, and set me loose. To this day, I clearly remember turning off the computer after finishing that first spelling assignment -- annoyed by the homework, relieved to be done, and a little pleased by the novelty of completing it on the computer. But nobody had mentioned anything about saving my work. And, living primarily in my reliably concrete ten-year-old's world, I believed that once I'd created something, it would continue to exist. Turns out, that was no longer correct. As smart as computers were supposed to be already, they apparently still did not realize that I did not create stories using spelling words for the sheer joy of typing. I would soon discover, too -- after additional frustration -- that floppy disks are fragile, sensitive things, so even saved work sometimes disappears or becomes unreadably muddled. My ten-year-old eyes were focused on the task at hand, on my little piece of the world in that time. I had no idea how much technology was in the process of changing the landscape of my world. I wonder how much I don't realize now.